Born and raised in Hopkins, Steve Kuhl has been a fixture on the landscape of Twin Cities contracting for 25 years. In 1987, at the ripe age of 17, he started Kuhl’s Contracting Incorporated, a company specializing in residential roofing and roof maintenance. In 1993 he began removing snow and ice from roofs professionally. Since that time he has acquired the equipment, manpower and expertise to run the worlds premier roof snow and ice removal company. Click here to see an ice geek. Steve is an expert in all things ice dam. Ice dam solutions, ice dam inspections, ice dam removal, ice dam prevention. He has personally removed hundreds of ice dams over the years (and was thrilled when others started doing it for him!). He has been refining equipment and labor systems since the company began to make us a global, yes we said it, global leader in this obscure corner of the contracting world. Expert ice dam removal might sound like an oxymoron, but it’s not. There are plenty of things to screw up, all of which can be expensive and frustrating to the client. 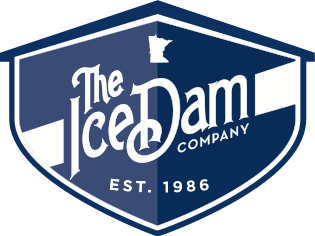 Perhaps the biggest difference between The Ice Dam Company and our competitors is what we have at stake. Steve’s primary job is to head up one of the country’s finest residential design/build remodeling firms. His name and the future of his companies are attached to every snow and ice removal job we do. We simply do not leave people unhappy. Ever. Click here to check out Kuhl Design+Build. Brook Budziak grew up in a construction family, and starting working with the Kuhl companies in 2014. She has quickly become Steve’s right hand, and sometimes the left too. She is the person who makes sure you are happy with everything relating to your ice and snow removal work. Brook schedules and manages our Ice Dam removal crews, sets up ice dam prevention jobs and helps our Ice Dam Heat Tape / Cable customers understand the best products to use in their particular situation to prevent damage from ice dams. We are professionals, up and down. It’s true that you may be able to find cheaper people to do your roof snow and ice removal work. That’s because they usually know what their work is worth. (see Craig’s List for the cheapest people). We have real roofers doing the work and real administrative staff scheduling projects and following up with clients. We are fully insured and fully licensed and we are always fair. Our reputation is built on that fact. We are in this for the long haul so every single project matters to us, no matter the size. It won’t take long for you to realize that there are plenty of sketchy people willing to get on your roof. We are not those people. Being in business as long as we have, we have learned who to trust when it comes to helping our business grow. When it comes to our ice dam steaming equipment, and pressure washing equipment at large, we buy only through American Pressure. It’s a family-owned and operated company that has always been fair and professional to deal with. If you need help buying some new equipment or fixing what you have, give them a call at 763.521.4442, or visit their website at www.AmericanPressureInc.com. Ask for Gary (the dad) or Ben (the son). They will take care of you. They have to compete against big box monsters every day, which is why we are so passionate about sharing their name with the world. When I get their photos I will paste them here.